Trent Bridge legend Derek Randall says Nottinghamshire bowler Stuart Broad will richly deserve reaching the milestone of 400 wickets in Test matches for England. Broad needs one more scalp to achieve the landmark in New Zealand during the two-match Test series that starts tomorrow (Thursday). And the 67-year-old Randall, who scored more than 25,000 first-class runs for Notts, says he will be delighted. “For him to get to 400 will be an amazing achievement,” said Randall, who himself toured New Zealand with England in 1978 and 1984. “Of course, there are a lot more Test matches now and they don’t play much first-class cricket. That said, the players are a lot fitter now and train especially for the Test matches, which is the right thing to do. Randall was thrilled to play so much cricket with New Zealander Richard Hadlee during his playing career. 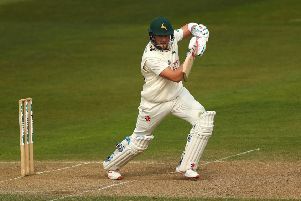 The Kiwi pacemen helped Notts achieve plenty of trophy success, and formed a formidable partnership with South African all-rounder Clive Rice. “They were such an integral part of the side,” recalled Randall.